October 22, 2013 - The National Transportation Safety Board today announced a series of postponements, delays and changes in Board Meetings, reports and other processes as a result of the 16-day federal government shutdown. From October 1 to 17, 2013, the United States federal government entered a shutdown and curtailed most routine operations after Congress failed to enact legislation appropriating funds for fiscal year 2014, or a continuing resolution for the interim authorization of appropriations for fiscal year 2014. Regular government operations resumed October 17 after an interim appropriations bill was signed into law. S&P reported the government shutdown cost the U.S. economy $24 Billion or $1.5 billion per day. During the shutdown, 383 of the 405 NTSB employees were issued furlough notices. "It is clear that safety was not served by the government shutdown," said NTSB Chairman Deborah A.P. Hersman. "I am pleased to say that the dedicated men and women of the NTSB are back at work, focusing on our important safety mission." 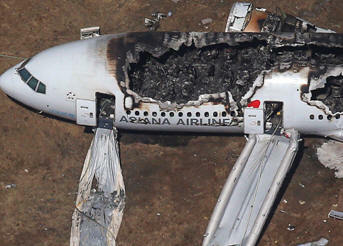 Asiana Airlines Crash During Landing: A two-day investigative hearing on the crash of Asiana Airlines Flight 214 at San Francisco International Airport has been postponed from November to December. Sissonville, West Virginia, Pipeline Rupture: The final report on the December 11, 2012, natural gas pipeline rupture and explosion has been delayed. The Board Members will consider the draft report before the end of the calendar year, but it will not be deliberated on December 3 at the previously scheduled Board Meeting. Seastreak Wall Street Ferry Accident: The Board Meeting for the final report on the probable cause of the January 9, 2013, Seastreak Wall Street ferry accident in New York has been delayed. A new date for the completion of the final report will be announced in the coming weeks. Boeing 787 Battery Fire: Additional testing of an exemplar lithium ion battery that was scheduled to begin during the shutdown had to be delayed. At the time of the shutdown, the NTSB had investigators on the scene of two accidents: a fatal general aviation accident in Santa Monica, Calif., and a Chicago Transit Authority rail accident in Chicago. The investigators in California gathered the perishable evidence before the shutdown and were furloughed on October 1. Investigators in Chicago remained on-scene for five days following the shutdown as they believed that the accident scenario could be repeated unless safety improvements were rapidly implemented. Once the NTSB issued three urgent safety recommendations to prevent a recurrence, those investigators were furloughed. During the shutdown, there were 59 new aviation accidents, of which ten were fatal crashes. In addition, there was a deadly motorcoach crash, a significant pipeline leak, a house explosion caused by a natural gas leak, a fatal grade crossing accident and a fatal transit accident. The agency launched investigators to only two of those accidents where it was determined that there was an imminent threat to life or property. The NTSB will determine the probable cause of each of the 59 aviation accidents, but some investigations will be limited in scope. While the NTSB will not initiate an investigation into the other accidents listed above, investigators will review reports and findings from state and local investigators to determine if there are any additional safety concerns that the NTSB should address. The NTSB continues to assess the long-term impact of the shutdown on hundreds of other ongoing investigations including the Boeing 787 battery fire investigation, the investigation into the May 23 highway bridge collapse in Mt. Vernon, Wash., and the investigation into the cause of the August 14 fatal crash of a UPS Airbus A300 in Birmingham, Ala.